The Expat: Bay Area­–native Brian MacDuckston, who’s slurped his way through some 2,000 bowls of ramen in pursuit of the best in Japan and chronicles his trail at Ramen Adventures. MacDuckston currently lives in Tokyo, where he leads food tours; through a partnership with the ramen school Toranoana in Osaka, he also offers an intensive one-day ramen course that includes soup prep and making noodles. Can you describe your Platonic ideal of what a bowl of ramen should be? Which spots in Tokyo come closest to serving this? A big impact followed by a smooth umami aftertaste. It has to instantly hit you, to be a great bowl for me. A good place for something traditional-ish (shoyu) like this is Hototogisu, while a crazier (spicy miso) one is Kikanbo. What are some current trends ramen in Tokyo? The most recent trend is simple niboshi-shoyu soups using high-quality ingredients. Niboshi are dried sardines, abundant in Japanese waters. Shoyu is soy sauce. It is a subtle blend that isn’t easy to make. The best is probably En, though it is a bit out of the way. A better one in central Tokyo is Hototogisu. If you really like the smoky, bitter flavors of niboshi, then Nagi Golden Gai is for you; it’s super intense. Past trends have always been a little extreme, like tsukemen, but I really like the return to simple, nourishing ramen. Tsukemen is where the noodles are served separate from the soup. The soup is thicker, more like a sauce. It is Japanese junk food, hence the popularity. Are there any telltale signs that a spot will have good ramen? A long line is a good sign, though not always a telltale. Sometimes it just happened that a famous TV talent went there the week before, and now all of the fans are following suit. Do you have any favorite ramen places in the US? I haven’t been to very many, but I love Totto in New York. This was a few years ago, before Ivan Ramen and Ramen.Co opened. I really want to check those two out! 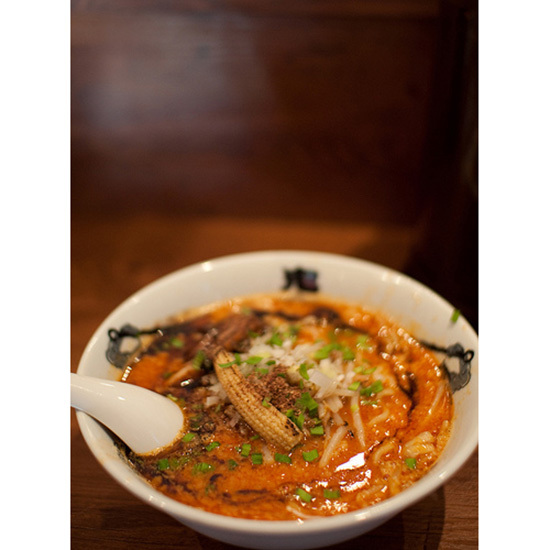 In San Francisco, I am a fan of Ken Ken for a more traditional take, and Ramen Shop in Oakland, for the crazy crowds and gourmet twist. What one food or drink item would you miss the most if/when you leave Tokyo? I’d actually say it is the sushi. I feel like ramen is slowly improving overseas to the point that I could get my fix if I lived in a big city, but sushi will never be like it is in Tokyo without paying a huge amount at a hard-to-reserve shop. My favorite sushi was at Sawada, but the price tag and difficulty in getting reservations made this a one-time thing. I have a go-to place that does a 10,000 yen omakase (the chef just serves whatever is good that day) that I frequent, but don’t tell people about because it is kind of undiscovered.